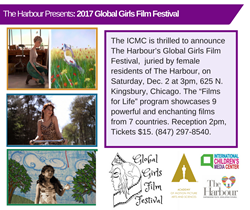 The International Children's Media Center (ICMC) announces the Global Girls Festival, featuring women centric short films, will be juried by female residents of The Harbour, a not-for profit organization providing emergency shelter and transitional housing services, on Saturday December 2, at 3pm at 625 N. Kingsbury St., Chicago. By the conclusion of the program, the girls noticed a dramatic change in the way they viewed not only films, but the whole world. Tickets to the festival are $15 and may be purchased by calling 847-297-8540 or at the door on the day of the event. There is a reception at 2 pm prior to the 3 p.m. screening lasting about 80 minutes. Attendees may vote for their favorite films immediately following each program. A "Best of Fest" prize will be awarded to the film that receives the greatest number of votes. For the premiere of the Global Girls Festival, the residents of The Harbour have curated "Films for Life," which highlights short films that embody messages of diversity and empowerment. The Global Girls Festival showcases nine culturally rich and stimulating films from seven different countries. "Made by girls, for girls, and about girls, the Global Girls Fest aims to rouse discussion about female related topics, and inspire women to question and engage with the media they consume," said ICMC Executive Director Nicole Dreiske. This is the second year in which residents of The Harbour have curated the Global Girls Festival. It's truly "films for life" because, as one Harbour resident and Global Girls curator, Nicole, pointed out, "This program is meant to look at the lives of others and "grade" them personally and connect them to my [sic] own life. What I want the audience to get out of the program is that life isn't easy, there will be ups and downs, but you can overcome them if you try hard enough and put your mind to it." The Global Girls Festival was created by the ICMC as a 14-week film immersion program and is led by ICMC Executive Director Dreiske. It is designed to prompt thought-provoking discussion of 40-50 short films screened by participants that culminates in the final selection of films curated by residents themselves. One resident at the Harbour exclaimed, "Watching these films, I was able to gain new perspectives, and I hope that others who watch them find a new way to view the world. Everyone in the world is connected through laughter and pain and that is exactly what they bring--human emotion." "By the conclusion of the program, the girls noticed a dramatic change in the way they viewed not only films, but the whole world, said Kris Salyards, Executive Director, The Harbour, based in Park Ridge. Harbour resident Shanika hopes to see the same change in the audience: "These films and program mean the absolute most to me, not even that, it means the world to me. Ever since I came to the first meeting I was drawn into it. It changed my perspective on life and made me think more about the stuff I can do going forward. That's what I want my audience to also get out of it." The Global Girls Festival showcases films from around the world to expose viewers to an array of diverse backgrounds. Another resident, Jessica stated, "This means a lot to me because it really relates to me and other people in America. I hope our audience can relate to us so we can show how life is." The screening of "Films for Life" includes nine powerful short films from seven different countries, and the chance to see uplifting stories for, by and about girls from around the world. Cheer for Anna who learns that inner beauty eclipses media images (Plastic, Australia.) The program includes two Chicago premieres and one world premiere. Miss Devine (US), I Am a Girl (Netherlands), Farewell (France), Reflection Day (US), Cupcakes (UK), Abuelas (Argentina/UK), Plastic (Australia), #Selfie (Germany), Birthday (U.S.). The Global Girls Festival is supported by Academy of Motional Picture Arts and Sciences, The Albert Pick, Jr. Fund, the Polk Bros. Foundation, The Richard H. Driehaus Fund at the MacArthur Foundation and the Conant Family Foundation. About The Harbour: Empowering Youth. Developing Futures. The Harbour is a 501(c)3 organization providing emergency shelter, transitional housing, and supportive services to youth aged 12-21 and who are experiencing homelessness in the north and northwest Chicago suburbs. The organization is committed to offering services rooted in the belief that youth must have their basic needs met before they can begin to build a promising future for themselves. Ballot List for Global Girls Film FestivalList of 9 contenders in the Global Girls Film Festival, juried by residents of The Harbour.